Improves plant health and nutrient absorption. 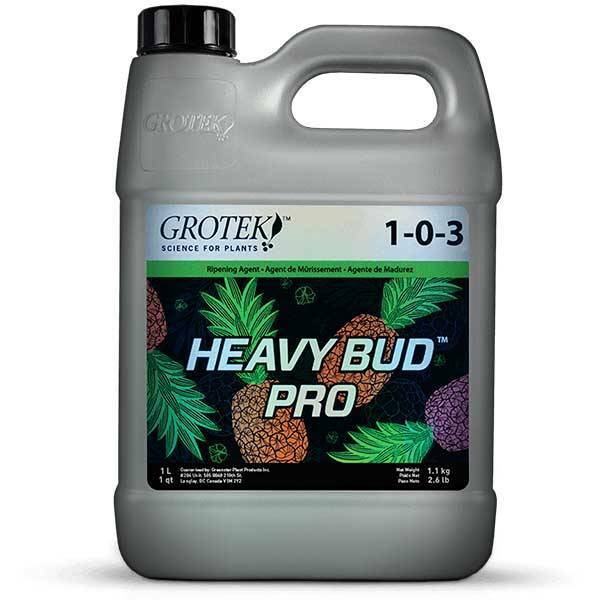 Heavy Bud Pro is an innovative product of Grotek, a revolutionary fusion of carbohydrates and nutrients that during the flowering period, helps to significantly increase the flavour, aroma and, finally, the quality of the crop. Heavy Bud Pro has NPK 1-0-3 values, contains oligo elements as well as calcium, magnesium and boron that work together to saturate the sugar while strengthening and stabilizing cell membranes, which will result in truly spectacular results. Heavy Bud Pro also contains amino acids that improve plant health and nutrient absorption. 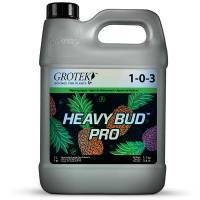 Heavy Bud Pro is the fertilizer that was missing from the Grotek cultivation program. Used together with Solo tek-Bloom, Blossom Blaster Pro, Bud Fuel Pro, Monster Bloom and Vitamax Pro, you will get a much stronger crop with spectacular buds and flowers. Heavy Bud Pro can be used with any other fertilizer range from other manufacturers, it works just as well and significantly improves the end result. Start using Heavy Bud Pro from the middle of the flowering cycle to the time of root rinsing, after only a week of administration you will notice more intense aromas and an exceptional resin production. When you taste the final crop you will finally be convinced that you have chosen the right fertilizer, this is guaranteed! Heavy Bud Pro can be used in hydroponic crops, as well as in earth or coconut.